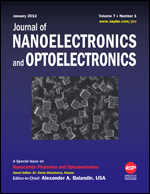 Prof. Ion Tiginyanu – Guest Editor of the Journal of Nanoelectronics and Optoelectronics. Prof. Ion Tiginyanu is the Guest Editor of the special issue of the scientific “Journal of Nanoelectronics and Optoelectronics” with the tentative title “Nanotechnologies and nanomaterials for electronic, phononic and photonic applications”, a cross-disciplinary peer-reviewed journal cited by the Science Citation Index and published by the “American Scientific Publishers” in California, USA. The special issue is planned to be published by the end of 2012. The articles should be prepared in accordance with the journal rules and submitted before August 30, 2012. To download the announcement, click here.